This scene takes place at Faubourg Montmartre, number 10, headquarters of L´Auto newspaper in Paris, at the beginning of 1910. 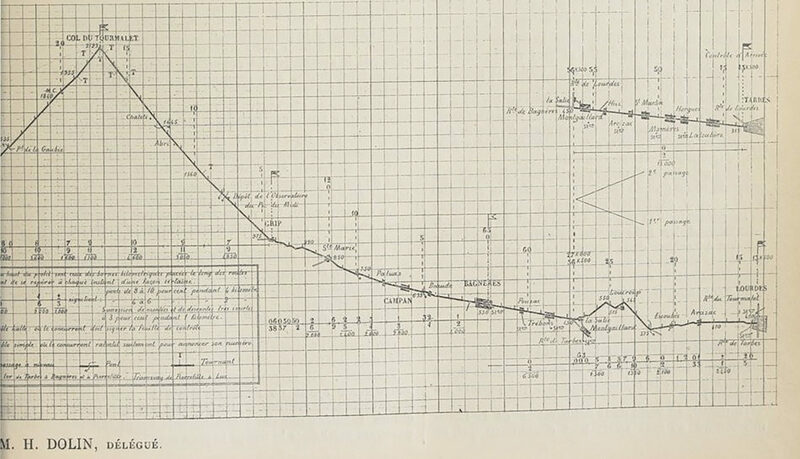 Just a few minutes ago, editor Alphonse Steinès presented an idea to director Henri Desgrange; an idea that seemed more like an epic feat. 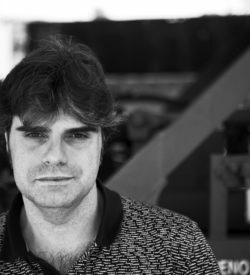 He wants to have Tour de France cyclists climb the large mountain passes of the Pyrenees. Peyresourde, Aspin, maybe even Tourmalet and Aubisque. “Impossible!” Desgrange roars. “It’s too dangerous, the routes are a mess, it can’t be ridden.” But he knows this creature of a man feeds on his own dreams. So… “Go, go there, and tell me if it can be done”. The next day, a barely-recovered Alphonse Steinès sends a telegram to Henri Desgrange. Misleading, despicable. Historical. A couple of hours later, Steinès finds himself in a drastic situation. There are no poles, no light. He’s freezing. His clothes are soaking wet. He’s feeling his way through the waistline-high snow almost blindly. He surmounts the colossal mountain in complete darkness and, in a totally stunned state, starts to make his way back down. At dawn he can make out some lights in the distance. It’s the small village of Barèges. When he reaches the first houses, a voice interrupts him. “Who is it?” Steinès is so exhausted, he can’t even respond. “Who is it?” they repeat, more seriously this time. “If you don’t tell me who you are, I’ll shoot.” The journalist whispers: ”I am Alphonse Steinès.” The other man recognizes him. Everyone has been looking for him since Dupont had sounded the alarm. They take him to a cabin, sit him next to a fire and put him in a wash tub full of warm water. Mountain natives know how to take care of men who come back from the cold. That is how the legend is told. And we are going to prove that it’s a lie. 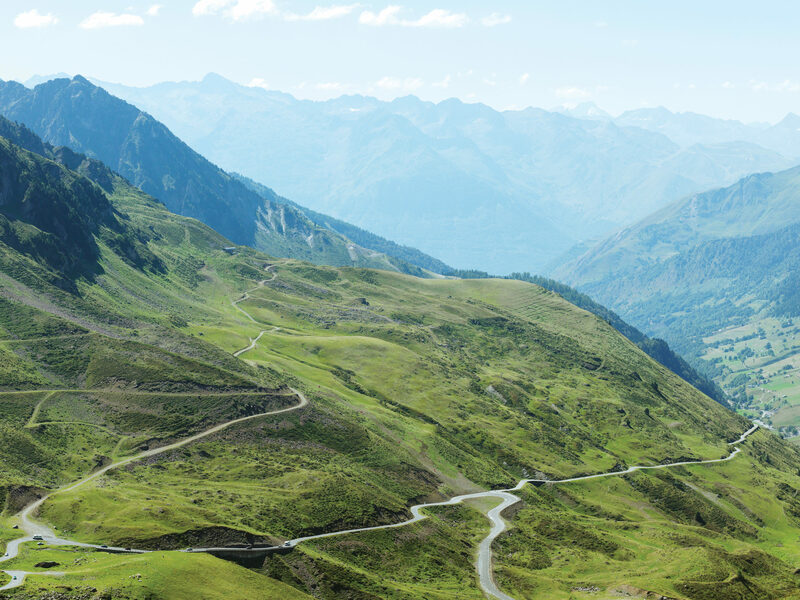 During the Middle Ages, the Tourmalet road was located right in the middle of Bigorre County, a small territory that stretched from Tarbes and Lourdes in the north to the Pyrenees mountain range in the south. 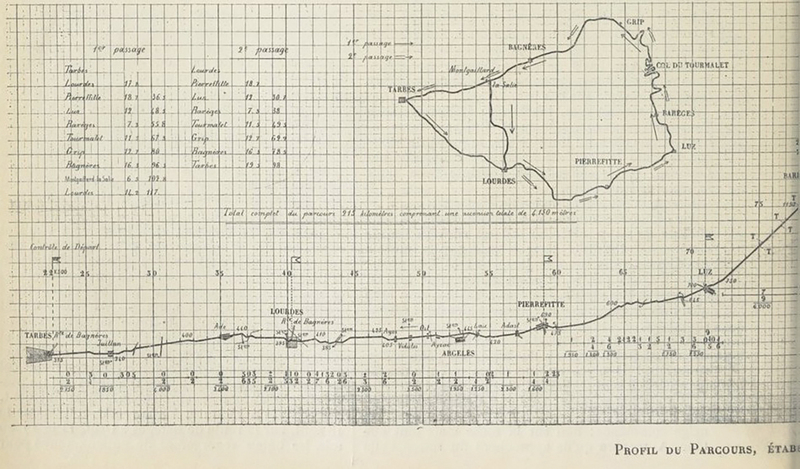 We know that Tourmalet was already being traversed around the year 1000 because Beatrice, the Countess of Bigorre, crossed it to collect taxes owed by villages in the other valley (as you can see, it’s so like a Countesses to collect taxes). It was also used as a path for pilgrims on their way to Compostela throughout the Middle Ages. The area boomed at the end of the 17th century, when Madame de Maintenon travelled to Barèges to bathe in the thermal springs. As Maintenon was the official lover of Luis XIV, this became a very popular trip among the big shots of the court. They would take ever more frequent getaways to the far-off Pyrenees to get some fresh air and to cure their bouts of gout or rheumatism. This is when they started fixing up the roads, adding military fortifications and constructing posh accommodations. This would grow even further in the mid-19th century when Luis Napoleon III began his ambitious project called “Route Thermale.” His goal was to connect all the spa villages in the region. 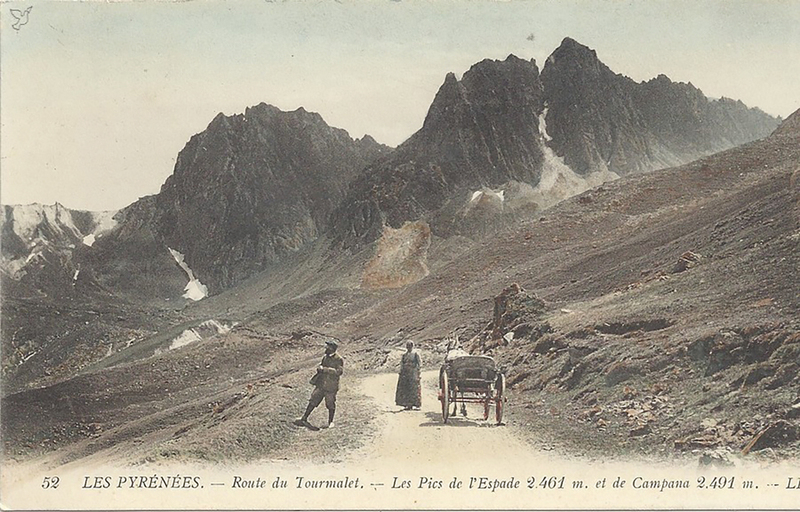 On 30 August, 1864, two cars reached the summit of Col du Tourmalet. One departed from Barèges, the other from Bagnères. That day, at one of the most sacred spots of the yet-to-exist Tour de France, the “Route Thermale” was opened. Like any grand opening, politicians (the prefect Garnier, legislator Achille Jubinal), engineers (Celler and Bruniquel) and a photographer (Maxwell Lyte) were in attendance. There’s no way this great event would not appear in the papers. In other words, this was not the centre of Paris. But, the roads between the small villages of the Hautes-Pyrénéens were already quite modern in the mid-19th century. What about cycling travel memoirs? As early as 1895, the ‘Imprimiere Industrielle et Commerciale’ publishes an interesting book titled Les Pyrénées et l´Auvergne a bicyclette. The author is a guy named Briault, who introduces himself as a simple school teacher in Chartres. He must have had legs of steel, though, because he basically tells the innocent story of a monstrous trip on board a heavy bike at the end of the 19th century in France. And his story tells nothing less than his climb up the gigantic Pyrenees. When the time comes and he faces Tourmalet, Briault has already taken more than a few journeys around the country, through passes here and there, and is well-aware of what to expect. He knows he is going to suffer, and he does. 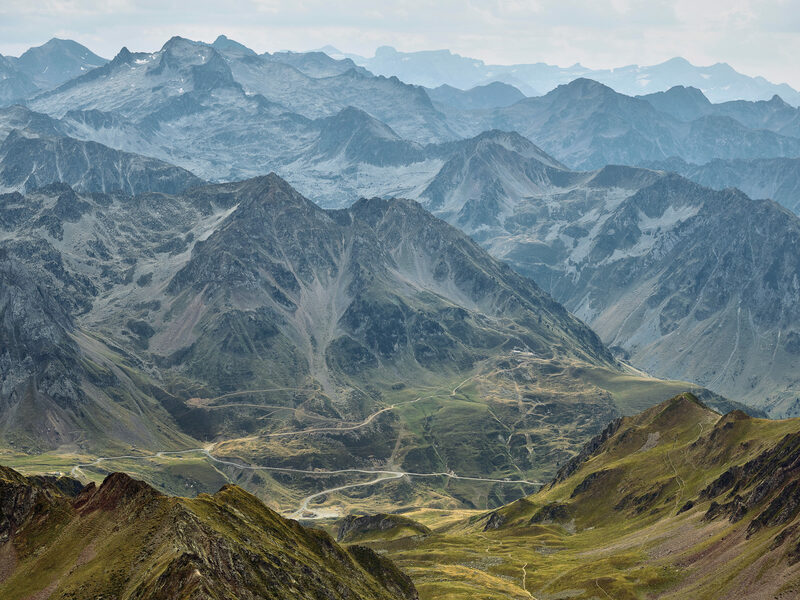 “On Wednesday, 7 August, I woke up at five in the morning.” And this is how the first story ever written (as far as we know) about cycling up Tourmalet begins. And it was a rough start. It was raining that morning and our daring Briault had a long think about whether to throw himself into such an adventure under such conditions. Fortunately for him, the sun started to peek shyly from behind the mountains just an hour later. Briault would get his epic feat, and we would get his breath-taking account of an honestly bizarre situation. At the summit, Briault is frozen by the high winds that eat away at him, little by little. And, there’s something else. He is afraid, very afraid. At the summit, Briault is frozen by the high winds that eat away at him, little by little. And, there’s something else. He is afraid, very afraid. Maybe, when he was surrounded by the grandiosity of the most grandiose mountain of them all, he started to realize what he had gotten himself into. Savage nature. He doesn’t confess, but we can read between the lines. When he examines his bike with care. Especially its brakes. When he moves his revolver so its within arm’s reach. Just in case. When he starts to descend, slowly, towards Bagnères. The gradient is very steep, but the author is surprised to find that the path is improving as he continues. He calms down. The entire route can be done on bicycle. And he starts to enjoy the landscape more. But he’s still careful. “Even the smallest of errors would be difficult to control and could be fatal.” And the chills and his fear come back. He tells us about a common practice in the cycling world: taking off the chain during descent to avoid breakdowns. He says he does not do that; he never stops pedalling. He says he controls his bike better that way. He launches towards the fog that covers the middle section of Tourmalet. And finally reaches the valley of Campan. It took him almost 45 minutes to descend the first 10 kilometres of the pass. The Touring Club de France was founded in 1890 and is considered to be one of the oldest French touring cyclist associations (at least it was until its dissolution in 1983). This Club was started by Paul de Vivie (known as Vélocio) and was very active at the end of the 19th century. At this time, riding a bicycle was as much of an adventure as it was a sign of gentry and of belonging to a certain social class. Club members received a monthly magazine where authors almost always wrote under a pen-name (so typical of the times) about their feats, and their fears. And among them was Tourmalet. 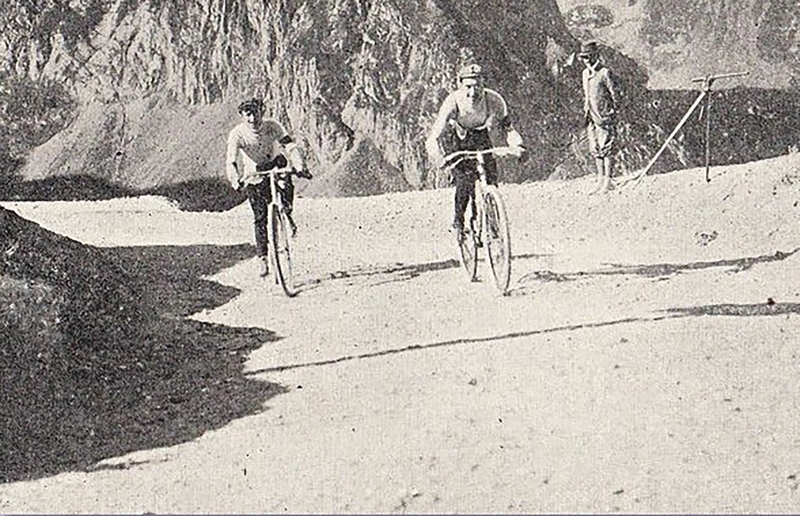 In 1900 they were already talking about climbing the pass for the first time. But they talked about how it was absolutely impossible to climb by bike and that long parts of the path had to be completed on foot. It can’t be done. It’s useless. Sainte-Marie-de-Campan was the first to attempt it, but on the opposite side of the feat lead by our dear Briault. It’s true that the road was very well-known (how could it not be, if it formed part of the “Route Thermale”) and that the pass was in the cyclist spotlight practically since the vélocipede was invented. And suddenly it’s 1902. 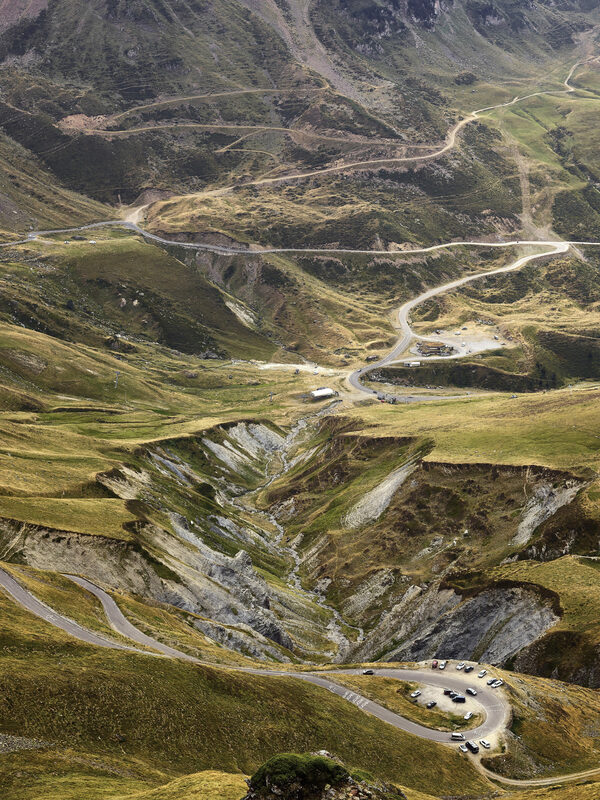 In January the ‘Revue Mensuelle Touring-Club de France’ announces its grand challenge; in order to test different mechanical components, the Touring Club is going to organize a race that goes up (and down) the Col du Tourmalet. The specific itinerary is 225 kilometres long. It starts in Tarbes, goes through Lourdes, climbs Tourmalet through Barèges and then descends to Bagnères-de-Bigorre to go back to Tarbes. It’s a proper race with checkpoints and time-taking. More conditions are added in each new edition. They explain the food and drink there will be at the summit of Tourmalet (bread, rice, hard-boiled eggs, cold meat, fruit, water, coffee, tea, lemonade and wine to celebrate). In March, they announce that the pass is still closed and has not been evaluated by the organizers. In April, they provide participants with a series of technical advice. Metres of development must be less than four… and they recommend not reaching three (in other words, approximately 39×28, which is impressive even today if you think about route’s conditions). They also remind readers that such a steep descent with such a short development could be dangerous for less-skilled bikers and they insist that participants practice almost free pedalling enough to avoid accidents. That they train. That they remember that the temperature at the summit of Tourmalet is almost always around zero degrees. That two pairs of breaks are needed, not one. That they watch out for loose cattle. That they save their energy. That said, Monsieur Montalescot, delegate of the Touring-Club France, is sure that any cyclist that is able to surpass Tourmalet will be able to overcome any other pass in the Alps and Pyrenees. On the morning of 18 August, 1902, a total of 24 bike manufacturers have signed up for their products to be tested at a place as symbolic as this. The name of some still resonate today: Terrot, Peugeot, Simpson, La Française, Automoto. Others only live in our memories and have left us with the aftertaste of legends: Lancelot, Gladiator, Hirondelle, Darrigade, Palmerantz. A total of 48 participants have signed up. The riders start departing Tarbes in pelotons of four or five, separated among themselves by a distance of one minute. Yes, a modern time for teams. The victor was named Müller, who invested 11 hours and 39 minutes in finishing the 225-kilometre route at a significant 19.31-kilometre average atop his Clément bicycle. He beat Fischer by 12 minutes, Barbé and Lapréé by 30 and Viviant by 45. In sixth place, at more than an hour behind the winner, was the famous Hippolyte Aucouturier, who would eventually win two Paris-Roubaix, in addition to placing second at the Tour de France in 1905. But the most remarkable person to have reached the summit of Tourmalet was Mademoiselle Marthe Hesse, a woman who conquered the colossal beast on a De Vivie that weighed around 16.5 kilos. And, she climbed the entire pass without getting off her bike (only for about “100 metres,” stated the article, hinting that she rested during an impassable section), while practically all the other participants had combined pedalling with walking for a number of kilometres (only “five or six” did it without getting off their bike). This was, without a doubt, a huge achievement… and it was also perhaps the first achievement for female cycling on rough Pyrenees gradients. Unfortunately, Marthe Hesse did not make it to Tarbes and she is recorded as having withdrawn from the classification of this opening session on Tourmalet. This field trip to test matériel definitely left its mark. For many months, every time the Touring-Club de France talked about an epic feat, they would compare it with the famous Tarbes and Tourmalet race. Deep down, they knew they had done something big, that they had left their mark on history. And that they had created a legend. It’s hard to understand the terror Desgrange felt, who pointed out that there were frequent bear attacks on the route, that the riders were also going to have to face this danger… that they were going to travel on the road nicknamed the “Circle of Death.” Of course, this name has a much bigger impact than “Route Thermale,” right? No, it all seems like a made-up story, a myth to magnify what was about to happen. The truth was that the Tour was entering a new dimension. If you liked this story consider purchasing Soigneur Cycling Journal 19 where it was first printed.